Last spring I wanted to have a garden, to grow tomatoes. There is nothing better than a fresh juicy, vine-ripened tomato! I have had a garden at our home in the past, but water is increasingly expensive and restricted, and my home garden plot is more shaded this year due to tree growth. Fortunately, my employer has a large fenced plot for community gardens where residents and employees grow vegetables and flowers. The value of unrestricted free water and full sun was too good to pass up. To add to the attractiveness of the venture, I partnered with one of my coworkers to share the cost and work in the garden. How did this turn out? Read on. In the past, I had decided not to garden at work. It would have meant staying after hours to weed and water, not to mention the 26-mile commute on weekends. The opportunity cost of time away from my family was too high. Now with a grown family and a gardening partner at work, conditions have changed. 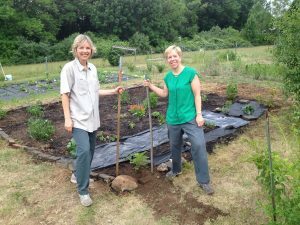 As my partner and I got to know other workplace gardeners, we found that some lived locally and were willing to water our plot on the weekends. In exchange, we watered their plots during weekday lunch breaks. My gardening partner wanted to plant squash, cucumbers, watermelons and herbs, while I wanted the tomatoes. The differences among us created gains from trade, and an equilibrium through which each of us could go further towards our goals. Principles of economics were in play! We had plenty of well water to irrigate the garden, and yet this summer’s low rainfall affected us indirectly: animals were desperate for moisture and food. Who knew that deer could scale the five-foot high fence? We noticed many young shoots eaten to the quick. Blossoms were there one day and gone the next! Almost-ripe tomatoes and cucumbers had small bites taken out of them! Local farmers too reported grazing deer—something they have never experienced before. Although much of our work ended up feeding the deer, I am glad to have done this gardening at work. In the end we harvested enough tomatoes and cucumbers for ourselves and also to trade for raspberries grown by a fellow gardener. And fortunately for our food supplies, the garden was not our sole source of vegetables! We loved time in the garden, enjoyed the tomatoes and other vegetables that survived, traded our crops and nurtured our friendship. Other relationships were forged in the garden, outside of the work arena. The supply and demand for land, water and labor among co-workers and our employer creates a steady stream of satisfied gardeners. The benefits went well beyond the delicious tomatoes we took home, and are why we plan on gardening at work again next year.